Watching the Tour de France on TV? It’s only one way to see the race. Every year an estimated 12 million people line the roads and a day beside road reveals plenty about the event. D-20: The Tour is a travelling Keynesian public works programme. Kilometres of the route are relaid with fresh blacktop to the point where you wonder if the peloton thinks France smells of tar in the same way the Queen probably thinks Britain smells of fresh paint. Other roads get repaired but the Tour seems to get priority, as if mayors and prefects are worried about comments on the poor state of the roads in their area during live TV. D-1: Before the race comes through the roads are prepared. Roadsweepers are busy the days before and municipal workers are out preparing the course, filling in potholes and attaching hay bales for safety in certain places. 10.30am: Come the day of the race and what first stands out is the experience and wisdom of many. There’s what the sociologist Pierre Bourdieu calls cultural capital as many beside the road come prepared thanks to years of experience. 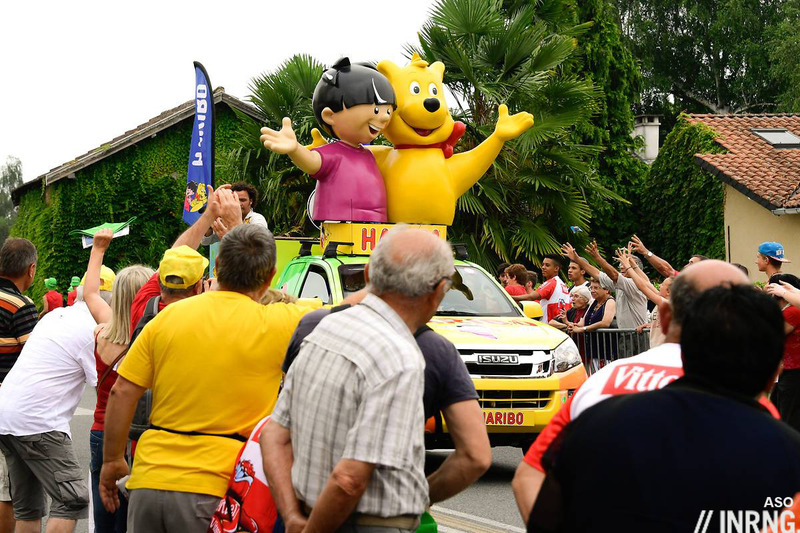 The passage of the Tour de France is an intergenerational rite as grandparents, parents and children line the road and the elders have it all worked out. A novice might bringing a camera and a bottle of water, the French family arrives with cooler boxes, chairs, a folding table and an umbrella for shade as well as games and books for the children. The roads are closed by police from the morning onwards. Every side road coming onto the course has gendarme in their blue uniform. This means a lot of gendarmes. Do burglars and villains exploit this? 11.00am: Those painted names you see on the road are not as simple as they look. Some Britons emerge with roller brush and tray full of paint and set to work in front of the idle crowds, something to watch before the race arrives. They paint a giant F on the road while pre-race Tour traffic comes past. They paint a giant R on the road as they try to steer oncoming vehicles around the wet paint which is drying quickly in the sun. They draw two large Os and then an M. Only by now they’ve reached the edge of the road leaving a giant FROOM as they hurriedly painted a compressed E in what was left of the road. This was all the more heroic given the price of paint in France, typically €15 a litre on the Castorama website meaning a pot needed to paint the ubiquitous ALLEZ ROMAIN probably represents a €10-30 outlay depending on its size. Midday: The camping cars are a feature of the race but they attract little attention from the TV cameras. Many are draped in flags, anecdotally there are a lot of Norwegians and Czech supporters by the road as well as many Belgians, Brits and Germans. Shirtless Norwegians sit in the shade as if the 21°C heat is sweltering. Most camper vans come from France and judging by the vehicle number plates from the flat north and west regions. Yet they seem homogeneous and interchangeable, invariably a married couple in their 60s. He’s not necessarily a cyclist. She’s got a book of crossword puzzles. A bottle of rosé sits on the table ready to be shared with fellow campers. France smells of barbecue. Better still is all the decoration along the way. The TV can only pick up the big things, notably the farmers with their staged displays in the field. All that’s designed for television to the point where the farmers’ union phones in the GPS coordinates to the television producer so that the helicopters can pick them up. All that’s invisible for the roadside. 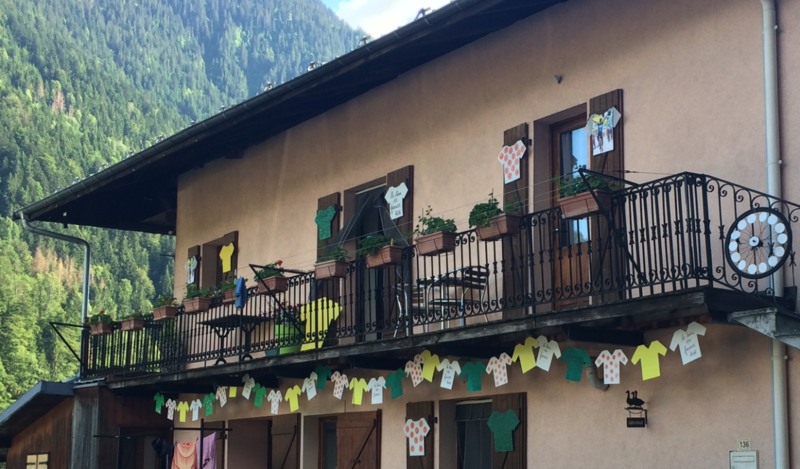 Instead you notice the smaller decorations, yellow painted bikes hoisted on walls, polka dot flower beds, small “Vive Le Tour” signs in people’s windows, a lot of this is invisible to TV but tells of the anticipation in villages. The Tour is the biggest thing to happen all year. 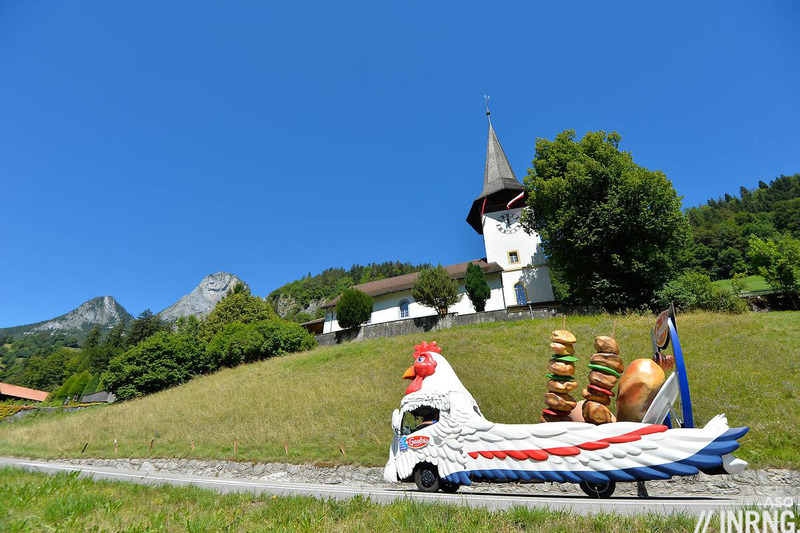 12.30pm: The publicity caravan is a hit with the crowds, especially the vehicles and staff that interact with the people. It’s an incongruous sight as giant vehicles roll past and their bass-heavy soundtracks rumble nearby farm buildings. It’s as if Times Square was dismantled, put onto trucks and driven through rural France. It’s nakedly commercial and the people love it. You might think the French are cautious about capitalism but watch as people dive into ditches to recover a keyring or pry apart stinging nettles to fish out a temporary tattoo of a corporate logo. Most often the caravan workers aim their goodies at the people. A packed of Haribo sweets here, a hat there and a bunch of key rings. 14 million items in total. It’s junk, collected in the cold light of day it’s underwhelming but the crowd goes wild. It’s astonishing as people fight to get a free product sample from a multinational and don the green caps of Skoda or the yellow hats of LCL seconds after catching them. Unloved companies like Monsanto, Goldman Sachs or Halliburton should take note. There’s politics in the caravan as the trade unions and the French employers federation take part. 1.30pm: It’s noticeable there’s a small exodus once caravan has passed. The actual race might be due but a few people simply are not interested, they came to see the weird vehicles and collect freebies. Among those that remain there’s an indifference. Many aren’t following the race too closely and just want to see the maillot jaune without necessarily knowing who is wearing the jersey let alone how they came to lead the classification. Few are listening to radios or checking their phones for the latest info on the race. 2.00pm: There’s a lull after the caravan as race vehicles pass, a mix of soigneurs driving to the feed zone and the media keen to drive the course. Cars come past blaring messages warning people to stand back and telling parents to hold onto their children. 2.44pm: The police bikes appear and the helicopters signal the race is close. The red Skoda car appears and the riders flash by. It brings to mind the quote from the film Amélie, “luck is like the Tour de France, you wait a long time for it and then it rushes by“, the cultural expression anchored in French minds is apt. The race is fleeting and there’s barely time to spot the riders. There’s Froome in yellow and his angular elbows. Thomas De Gendt. André Greipel looks pale. They’re gone. The parade of team cars drives by with a few riders in the mix, are they dropped or fetching supplies? Finally the broom wagon comes past, today without a broom on top and most likely empty too. There are few abandons these days and when riders quit the usually use a team car. The broom instead belongs to the municipal workers who come along to clear up the debris left by the crowds. 2.47pm: Time to pack up. Those with camper vans or the full set of chairs and tables don’t seem in a rush to move on. All told it’s a grand picnic by the road interrupted by some wacky publicity vehicles and the fleeting chance to see the cyclists flash by. The race is made so much bigger by the crowds with their presence, vibrancy and noise yet the crowds hardly see any of the racing. We had a couple of great days next to the race this year. Day one was in the town of Montluel at about 20km to go, and day two was in Culoz on the finishing circuit. We were close to where the soigneurs were handing up bottles as the riders went around for their second shot at the Grande Colombiere and – without being asked – one of the Astana soigneurs gifted my six year old son a bottle with a big smile. Not sure if he realized it but that soigneur turned my son into an instant Astana fan for life – he even took the bottle to bed with him that night in case he “needed energy” while he slept. Interestingly, after the race another Astana rider went out of his way to avoid the crowds of older kids asking for his bottles and instead stop and offer it to a quiet, smaller kid. I wonder if this is on instruction from the team in an outreach effort or just a coincidence, but either way it’s great PR. Nice story – I’m 37 and still treasure my Wanty Group bottle that fell off a riders bike on a section of cobbles in Paris Roubaix 2015. Had to try a swig of what was in it too. It was horrible. Yup, my boys treasure the Sky bottle discarded by Porte on Holme Moss in 2014. The scrapes on the cap only add to its emotional value as those are what distinguish it from the rows of identical ones for sale in Halfords. Thankfully for a leftie parent, they haven’t become fans of Murdoch’s dark empire, only Brailsford’s one! Great to see children/families out on the roadside. That feeling of anticipation when you see the helicopter in the distance never ceases to get me buzzing. Thanks for the completely unexpected article. In general an excellent potted story in a ‘day in the life’. Just one word of caution to those who may be inspired to live the dream. Race days in mountains can start much earlier than IRs leisurely 10.30. You have to aim to be on many of the mountains before first light to beat police blocks. I know from experience, having walked most of the way up Ventoux when the roads at the base of the climb were closed by 05.00 am ! Most of it is junk indeed, but I’ll treasure my Carrefour King of the Mountains Casquette. There are many like it, but that one is mine. My PMU big green hand is a treasure from about 8 years ago. I am 48 years old. Was that the one with the razor-sharp edge? Careful, Steppings, Thor Hushovd is still looking for you! My daughter lost her Red Peas casquette within hours of me catching it? I fear she is lost to the sport. 1/4 inch thick foam, but at 60+kmh yeah it might hurt haha. My (now) wife paid who knows how much to get me one off eBay for Christmas the year I went and couldn’t actually seem to put my hands on a giant foam hand. She wasn’t even there. What a legend. Those carrefour caps might be cheap tat, but I remember standing like a sardine in the crowds in Harrogate with the sun beating down on my face. I would have fought with a small child to reach a cap to shade my face. As it happens I’m 6 foot 5 so I just reached above everyone else, and it was a godsend. It is an incredible experience I would love to repeat and seeing the speed the riders go past at cannot be appreciated on TV but you are definitely going for the experience rather than to watch how the race unfolds. Most of the tat went in the bin long ago but I do still have a box of “Yorkshire Thé” in the kitchen cupboard. I do too, and some of the Taylor’s of Harrogate Allez Allez, both unopened. That’s good coffee, actually. My wife recently opened my box of said Yorkshire Thé and actually made a guest some tea with it, much to my disgust. She apparently doesn’t appreciate its sentimental value. We watched the Tour in Yorkshire. There was a bloke behind us with a huge fishing net on a pole. He got loads of swag. Us Brits have truly embraced cycling. My girlfriend’s mum is from Yorkshire and an artist. One of the Yorkshire Thé boxes got framed with a dry stone wall backdrop painted on, yellow frame, and it hangs on their kitchen wall. Just a passing ironic thought, but I wonder what the carbon footprint of the Tour is? It’ll be massive, the roadside traffic that passes is only a fraction as most of it takes the “hors course” (off race) route from the start to finish, all the TV production trucks, mobile VIP stands and much more. Really interesting article, thanks for writing it. Sounds like the French public who attend these events have the system down pat, just like Americans have great tailgating set-ups for their college and professional football games. Great parties, making the sporting events secondary. 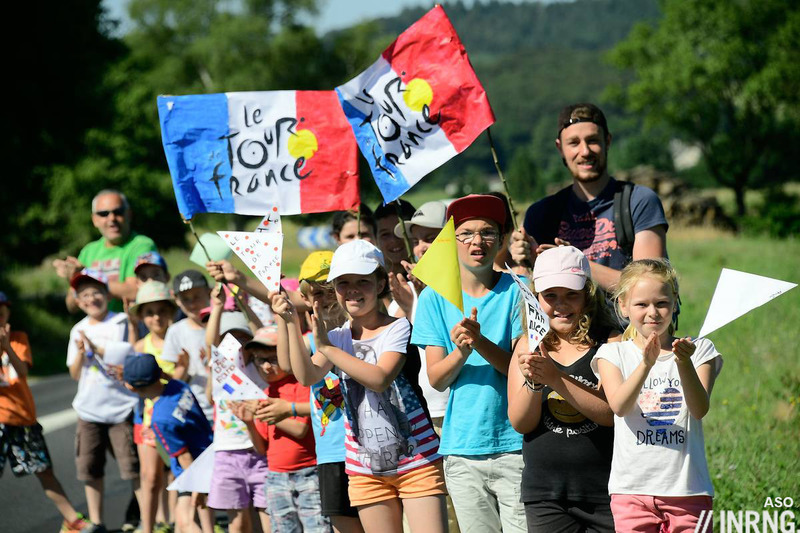 In a way, the entrance fee for these fans (in the same way that football fans pay tickets) is from their property taxes, which go from them to the municipalities to the TdF organisers. So, in a way, at least in France, ASO does receive ticket revenue (indirectly). Britain’s new Foreign Secretary gets around, doesn’t he? The best thing about watching it at the side of the road is trying to figure out who the riders are 🙂 Catching a mobile signal is nigh on impossible with thousands of people all trying to share one GPRS stream. We were at the top of Puy Mary on Stage 5 and all we knew was that the breakaway had three (or was it 13?) minutes on the peloton, or was it three riders? It’s so hard to pick it up from the loudspeaker car as it passes. Then you see a Lotto and BMC rider turn up. Is that Thomas de Gendt? Who could it be from BMC? It’s not Richie or Tejay… Who’s that Astana bloke? It’s not Nibali. In the gap between the riders there’s a general hubbub and you try and pick out other spectators’ inaccurate speculation and pass it on as fact. Once the peloton turns up it’s just a whir of jerseys – lots of Movistar and Sky – look there’s Froome’s elbows! Is Sagan here? Not seen him yet. More names being shouted out apparently at random from other spectators. Then there’s a bunch of stragglers from the main group. Is Sagan there? Not yet. Have we missed him? Another bunch. Any sprinters yet? There’s Sagan – of course we didn’t miss him! He’s turning a mega heavy gear. Any sprinters yet? Where’s Cav? Here’s the grupetto. No, that wasn’t the grupetto, this group must be it. Seen Cav? No. Ah! This is the real grupetto and there’s Cav! And that’s it. The odd straggler in the team cars then its back down the mountain to decode your photos. Oh, Quintana was there, right in front of me! And watch the highlights on TV and catch 4 pixels on the screen that might have been you. You mean you forgot to run along with and in front of the riders gurning for the camerals like a goober? Rookie error. Tour de Yorkshire this year, also ASO, had a car going some minutes ahead of the race on the third stage with a public address speaker to tell the roadsides what the race situation was. Great, and true, account of a mountain stage. I had a great time when the tour came through Essex in 2014. The local school put on a bbq, there were a few stalls, a big screen showing the race and most of the schools were closed due to road closures so there were loads of families there. We got to our chosen point about midday and there were already hundreds of people on the road side. We chilled on the road side for a bit, the caravan came past and we collected our freebies, got a bite to eat and then saw the race flash past. The tail of cars and motorbikes took way longer to pass then the actual peleton itself. We then went and watched the culmination of the race on the big screen with a burger and ice cream. All in all it was a great way to spend an afternoon. There was even a helicopter parking zone at the back of the school, so we got to see 3 or 4 of them parked up for a bit. Even though you only get a fleeting view of the race road side it’s amazing the narrative you can get from just your snap shot. I remember watching the Olympics and seeing Vinokourov and Uran Uran come through and thinking. That’s torn it. The rest of the peloton came through looking non-plussed, with David Miller following on behind looking shattered. Then a bedraggled and sorry looking Cancellara slowly cycled on through, which was a distillation of the race in its own way. When the TdF came through London I remember watching Andy Schleck trail pretty much everything….and that was the end of his career after that crash. Sad to see a contender struck so low. Lovely article thanks and following in the footsteps of this photo essay from the Guardian the other day. I will never forget riding to the Cote de Grinton Moor and finding a great spot on the bend just after the bridge. The wonderful atmosphere, with the crowd cheering everyone riding up (especially the kids! ), the long wait, the excitement as helicopters are sighted in the distance, the rumours going round (Jens is on the attack!) and the whirl as they fly by, so much faster than I expected. A huge cheer for the Jensie, and the roar as the peloton shot through seconds later – Cancellara flying by inches from me – over in a few seconds, and yet a memory I will have forever. Soooo grateful I didn’t try to film it on my phone though ! Thanks so much for the beautiful article! Some great experiences above, I suppose it’s the scarcity that makes the freebies special, even for France the race is only going to come past once every few years so no wonder the British stages and the items handed out were even more special. As an aside to ride in France is to see farmers in the fields and look closely and they’re driving tractors while wearing hats they got from the Tour de France or an elderly person tending their vegetable garden with a cycling cap on stamped with an old brand like Ryobi or Butagaz. To everyone else I’d recommend a visit to experience the Tour from the roadside, you can use the days before or after the race to try the roads for yourself if you’re into riding, it’s completely different to following the race for 21 days via a screen. Nice article. I also still have my box of Yorkshire Tea! Spent a good few days following the tour in Northern France last year. The best time was in the small town of Gamaches. Watching everyone chase after the souvenirs, then trying to work out who was in the breakaway group, the main peloton coming through and finally the stragglers. Best bit was then cycling back over the route into Abbeville and receiving the cheers from the French families still sitting out in their front gardens with their picnics and wine. Very bitter piece. Trying to be humorous-realistic, it smells of jaundice and petulance and “foreignness”, I’m sorry. It’s too easy to laugh at the French and the Tour de France. Way too easy to laugh at rituals without feeling part of them. On an occasion like this, better emulate Barthes than Houellebecq (and even Houellebecq would have been warmer). I’ve just been on the Côte de Domancy with my 4-year old. In the middle of all the cheapness and corniness, he experienced more the feeling of “sacred” than at church, I tell you that. “Bitter”? I read it as being a warm-hearted piece but each to his own! Thanks, worried for a moment it came across the wrong way as it was a fun time that everyone should enjoy… and you can only describe your haul of caravan freebies as junk if you’ve collected enough of them yourself. No “jaundice and petulance” meant, just a chance to show a different view to the TV experience many get of the Tour. It struck me as an affectionate portrayal. Why else urge people to try it? And in that spirit I’ll say no more. I don’t think INRNG meant to condescend to the French. I was on the Côte de Domancy yesterday as well with my 15-year old son, who is only a cycling fan during the Tour. We arrived well after the caravan passed, but in time to see a good half the peloton go by one by one. The general atmosphere INRNG describes is accurate. 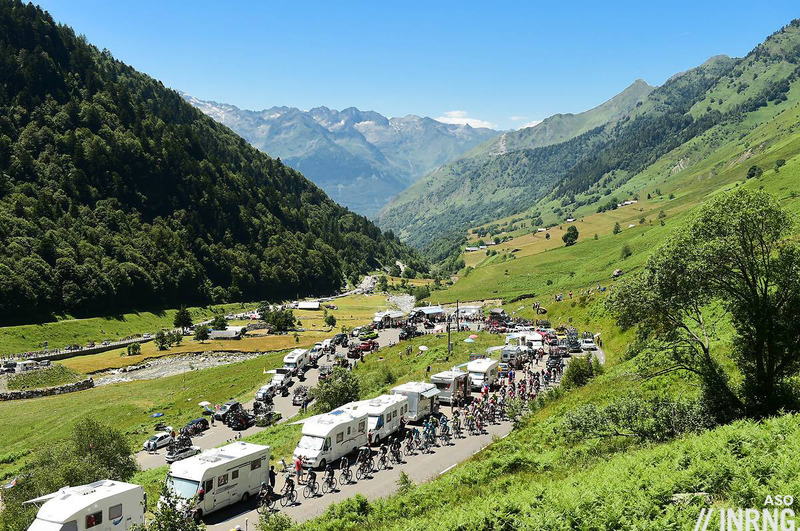 We fell to chatting with a mixed group of Brétons and Savoyards, the former cheering particularly loudly for Warren Barguil, the latter for Alexis Vuillermoz (born in the Jura, but an honorary Savoyard by virtue of riding for AG2R). They had their small children, hampers and large flags of their respective regions (I wish I had a euro for every time I overheard someone identify the Savoie flag as Danish). Several of them were quite informed about pro cycling and one had just done the Etape du Tour). A local baker walked by selling fresh croissants, and other locals were doing brisk business in soft drinks. Yet more very drunk locals were walking around banging enormous cowbells. In addition to all the French out having a good time there were a lot of Colombians, Brits, Germans, Dutch, Belgians, Norwegians and assorted North Americans. Unlike a road stage, it’s not all over in a flash. Sacred? Hard to say, but my son agreed with me the atmosphere is what made the experience. If not for one of the Brétons giving regular updates from his cellphone, I would have had no idea what was going on in the race, but it was great fun. Yes I agree a rite of passage for every fan. Just respect the riders and stand well back. But having attended some big races I’m somewhat over standing by a roadside for hours. I remember some in my our tour group getting up at 2am to get on Ventoux before the roads were closed. Road racing, esp if it’s point to point, is made for tv. Better suggestion when in France, Italy or Spain is to ride in the morning then freshen up and watch the race in a bar/cafe over lunch with a few drinks. I heard on French radio station RMC that 47% of the crowd is their for the caravan (survey in 2013). I’d have to agree that very few people are actually following the situation and the irony is that by going to see the race, as great as the experience is, once the front of the race has gone by you’ve got to rush away to find a radio or TV to catch the end because you’ve no idea what’s going on anymore. We went 5 years back and watched a stage finish with our 2yo and we got so many freebies at the finish – guess they have a daily quota to get rid of – but were there practically the whole day defending our viewing point. Came away with 8 hats and the big green PMU hand plus loads of tat. Saw Cav win and mount the podium, wandered past Wiggins and Voeckler doing Press. 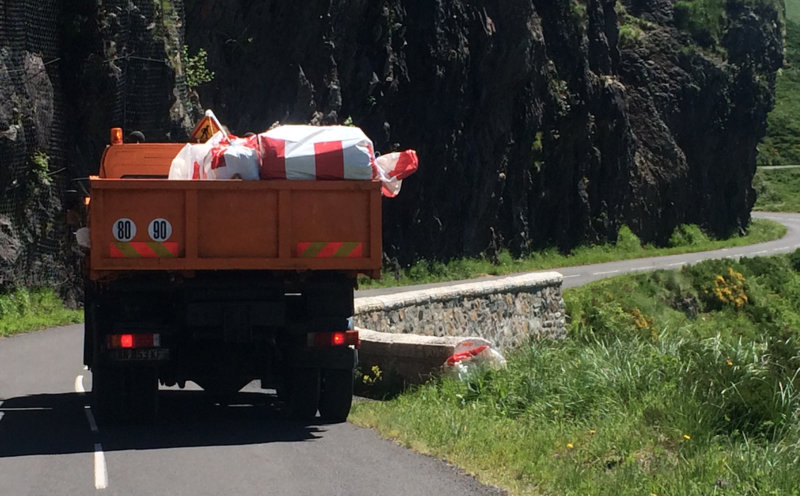 next day i cycled out to watch a KOM in Brittany – dodging the Gendarme who didn’t want me on the course. Waited amongst French family groups in a thunderstorm trying to communicate with decades old GCSE French. Watched the infamous Hoogerland break pass us (before the collision) so I’ll always remember that, then the peloton taking up the full width of the road and making spectators dive into ditches. Happy days. After years of following and long days of the Summer back in the early 90’s watching Big Mig doing his thing on a bad TV in my older brothers box room, I have always wanted to get to France for the greatest show on earth. Three of my brothers and I went in 2013 for my 30th birthday, if only to Paris for the final day, but it was unforgettable and a great experience to share after those aforementioned days! 98′ is remembered for all the wrong reasons but I won’t forget it passing by my front door when it came to Ireland. 4 of us were hanging out the windows on the third floor (a rickety old townhouse in Cork) when a publicity caravan flung a pen all the way up to us, a piece of tat my brother still has! We are still planning the mountain raid and I think I will be the only one able to ride (things change over time!) but the tour is a magical thing even after a these years and as late as we were in getting to see it firsthand it wont be the last time. The tour = memories of Summers abandon for me. I’d just also add that throughout the course of the day you’ll see hundreds of recreational cyclists ride the course to find their spot along the road. Everyone is very nationalistic and very friendly.